I started Tai Chi a year ago training with Lead Instructor Aileen Hamdan and occasionally with Lead Instructor Aaron Whitaker. Four years ago I retired and stopped working, I am now in my late 60s. During the last years previous to my retirement from a very demanding job, I experienced a considerable amount of stress causing anxiety and disrupted sleep patterns. This eased slightly the first two years of retirement but eventually problems with sleep returned leading to progressive tiredness. At the very beginning of my Tai Chi training I felt tired with joints aching everywhere but after about a month I started feeling more energetic. Since the beginning of September 2015, I was able to join two more classes to top up my training. My sleep has improved to the extent that I now rarely have uninterrupted sleep and when I do, I can go back to sleep straightaway. My breathing and posture are improving too and I cannot remember when my energy level had been as high as at present. Tai Chi is so wonderful because anybody at any age can join and feel the benefits both mentally and physically. The slow movements and gentle exercises can be adapted to one’s physical requirements. That is why it is so good for the needs of the older generation who cannot withstand more strenuous physical activities, but equally for those who have a temporary or permanent physical disability. I have become a volunteer after seeing all the instructors and volunteers dedicating their spare time to Dao Lu, a non-profit community interest company promoting this amazing art for the benefit of all sections of society. In particular I have been inspired by my Instructor Aileen in her incredible and ever increasing dedication in spreading the knowledge and promoting the practice of Tai Chi, Qi Gong, and other related form of arts. 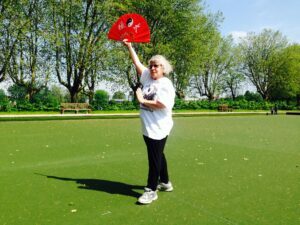 I have personally truly benefited from Tai Chi and my future journey is to continue to practice and improve as well as dedicate my spare time, and with other volunteers and instructors, to help Dao Lu achieve its objectives.